Colibacillosis is caused by the bacterium Escherichia coli (more familiarly known as E.coli), with most incidents in garden birds associated with the strain O86. The timing of outbreaks within the UK appear to be slightly different from the pattern seen in Salmonella, with most cases seen in a recent Scottish study occurring in the months March to May. Colibacillosis is known from a wide range of species, with reports more common for social species like House Sparrow and Greenfinch. Affected individuals appear fluffed-up, weak and lethargic. E.coli does not damage the internal organs in as visible a manner as Salmonella but the toxins that it produces may prevent the digestive system from working correctly. Although human illness from E.coli O86 is uncommon in the UK there is the potential for spread to humans. As such, it is essential that sensible hygiene precautions are taken when cleaning feeding areas used by birds or removing and disposing of carcases. Follow sensible hygiene precautions as a routine measure when feeding garden birds and handling bird feeders and tables. Clean and disinfect feeders and feeding sites regularly. Suitable disinfectants that can be used include a weak solution of domestic bleach (5% sodium hypochlorite) or other specially-designed commercial products. Always rinse feeders thoroughly and air-dry before re-use. 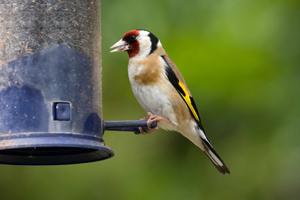 Rotate positions of feeders in the garden to prevent the build up of contamination in any one area of ground below the feeders. Empty and air dry any bird baths on a daily basis.